Reblogged this on Immodestia Dark Culture, fashion and Style Blog. I was awestruck by this film and intensely moved. By the end I was in full sob and I still get a little choked up thinking about it now. Quvenzhané Wallis is truly one of the best young actors I have ever seen. As an ex-social worker I found it very annoying to watch. I think the movie has some merits but I also felt that it is taking advantage of a culture. I couldn’t figure out why this movie needed to be made. People who refuse help and then everyone jumps on a bandwagon to raise money so that they can sit back and continue to live in squalor. It teaches dependency rather than self-sufficiency. If these were strong souls who wanted a better life, I could respect this but I did not see this at all. That is why it was annoying. Also, as I am an ex-social worker, I was constantly afraid of boundaries being crossed even more between father and daughter. That part alone had me creeped out the entire film. Voyerism is all I could get from the movie, in our age of reality shows and making fun of people’s lives. I have been putting off seeing this film….don’t know why. But your review has prompted me to check it out. This was one of those films where I never quite knew where I was or what I was watching, but I enjoyed the journey. More than anything, it was watching Quvenzhané that won me over. I think you just have to go into this one not expecting a strong story, but rather a string of unexpectedly strong emotions. 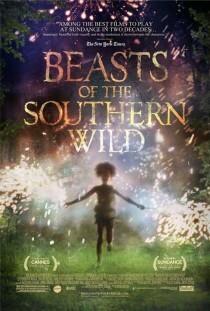 Little Quvenzhané Wallis was phenomenal in this film. Loved it from the beginning to end. We need more films like this. This is one of those movies people either love or hate, not much in between. I loved it, my roommate hated it. It made me feel a range of emotions, happy, sad, angry, and I admit sometimes confused, but I think that’s what makes a good movie. I watch a lot of movies to relax and forget but it’s nice when a movie can make you think as well. Now this is a wonderful Movie. Watched it,loved it! The most evocative film of 2012. Wallis’ face makes me well up. I loved this film too. One of my favorites. Absolutely beautiful and enchanting film! I have to tell you all something funny: my mother wrote to me yesterday and told me, “That film ‘Breasts of the Southern Wild’ sounds very interesting”. I should like to see that film, true the accent initially is hard to understand but one gets into it soon enough. Thank you for the tip off. I agree with jkvegh, the social worker. I grew up around some of the behaviors of islanders like the ones in this film, and there are no boundaries. I found the movie to be very upsetting and I was anxious the entire time. Not realistic to what uneducated, unsupervised, debilitating poverty looks like for little girls. Reblogged this on Music In the Dark.